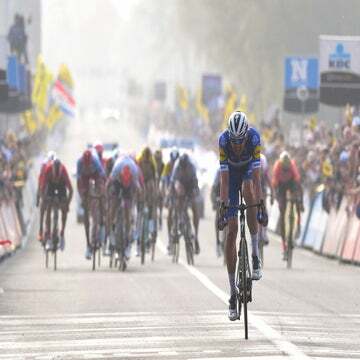 GENT, Belgium (VN) — Deceuninck-Quick-Step was back in the winner’s circle Wednesday when Fabio Jakobsen kicked to victory at Scheldeprijs for the second year in a row. It had only been 24 hours since Julian Alaphilippe had won stage 2 at the Itzulia Tour of the Basque Country. A week before that, Zdenek Stybar won E3 BinckBank Classic at the end of a day of near-perfect tactics by the Belgian outfit. Deceuninck-Quick-Step is a winning machine, but how do they do it? With so many big names on the same team, how does Patrick Lefevere keep the wheels turning without egos and ambitions stopping them in their tracks? With Lefevere, the team has consistently out-performed its rivals in the northern classics dating back to the 1990s. Under his watch, riders like Museeuw and Boonen emerged to be the dominant riders of their respective generations. Currently, however, the team is not built around the legs of one singular franchise rider. In fact, the team’s latest iteration, coming in the wake of Boonen’s retirement, reveals just how deep and balanced the team truly is. Lefevere hunted out young talent and has built a team around a foundation of a few reliable experienced veterans. The stars, like Elia Viviani and Alaphilippe, get their wins, but the second-tier riders also know their opportunities will arrive. It took Stybar several years to finally break out with victories in this year’s Omloop Het Nieuwsblad and E3, but he never wanted to race anywhere else. Quick-Step brings a unique mix of focus, teamwork, and specialization that has some calling them the Team Sky of the spring classics. Just as Sky has emerged as the grand tour dominator, Quick-Step has largely done the same thing on the cobbles, pavé, and over the hills of the Ardennes. First off, everyone knows who is the boss at Quick-Step. Lefevere rules the team with an iron fist, and he demands complete loyalty to the team, above all else. Anyone who puts themselves ahead of the interests of the team is quickly jettisoned. Lefevere also quietly relishes watching riders who have left the winning confines of Quick-Step struggle when they chase a bigger paycheck on a rival team. Quick-Step’s winning tradition works as a natural magnet for promising talent and winning veterans. There was only one team that Belgian protégé Remco Evenepoel was ever going to race for. Lapage is right. Just as big GC riders gravitate toward Team Sky, the peloton’s best classics riders want to be on Lefevere’s teams. When Philippe Gilbert was looking for a new team in 2016, he reached out directly to Lefevere. As a Belgian, Gilbert wanted to race on Belgium’s biggest team before he retired. Gilbert accepted a lower salary stacked with incentives, and he quickly paid back Lefevere with his dramatic Tour of Flanders victory in 2017. Just as often as Gilbert is in the mix, he’s also doing the hard work for his teammates. Last year, it was Niki Terpstra who was steam-rolling through the classics, and Gilbert rode in support. Gilbert knows that the dynamics could turn back once again to his favor, so that’s why he wanted to be on this team. Quick-Step’s strength is its depth, and it always races with several cards to play in most of the major one-day classics. For Sunday’s Roubaix, Gilbert, Stybar, and Belgian national champion Yves Lampaert will all line up as protected riders. If one of them gets in position to win, the rest of the team can mark wheels and disrupt the chase, knowing full well they can profit if the action changes. With so much depth, the support riders know that if they do their job, the team has a very good chance of winning. Lefevere’s almost singular obsession with the classics means several things. 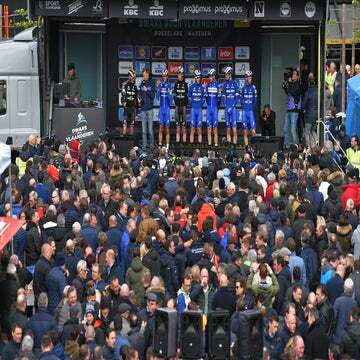 First, the team has the experience and a winning tradition on the Flemish roads that other teams cannot touch. If you want to be the next Tom Boonen, you don’t want to race for Team Sky. And with its deep classics roots, Lefevere’s sponsors are almost always from Belgium’s Flanders region. Sponsors want to see the team win on home roads, not in some faraway stage-race. As a result, Lefevere spends the majority of his budget on the classics teams as well as on fast sprinters. That means a lot of wins in the one-day races and important stage races, enough to keep the Belgian sponsors clamoring for more. Most teams simply don’t have the depth or budget to bring various options to the major one-day races. Lefevere has a dozen riders who train and prepare for the spring classics, meaning sport directors can tap the absolute strongest riders for the major races. For example, few outside of Denmark had paid much attention to Kasper Asgreen before he stormed to second place in his Tour of Flanders debut, but the sport directors saw how strong he was, and put him on the Flanders squad despite having no experience in the race. Lefevere’s teams won’t be taking on Team Sky at the Tour de France for the yellow jersey, just as Team Sky has never won Flanders or Roubaix. On Sunday, Lefevere and his troops will be ready for battle. The goal, as always, is victory. Surprisingly, it’s been five years since one of Lefevere’s riders has won. After an uncertain off-season, Lefevere was able to keep together his winning machine with the arrival of sponsor Deceuninck. The team enjoyed its best season ever in 2018, and is continuing to steam roll through this spring.